I was uncharacteristically browsing the Crime section at my local library and came across this. The title sounded interesting, as did the back of the book, so I thought to give it a try. All I can say is that I'm glad I didn't pay for it! The Dog Who Came in from the Cold is the second book in the Corduroy Mansions series, so the fact that I haven't read the first one may have fuelled some of my dislike for it. Perhaps I should've started with that? But then, they didn't have it at the library anyway and I couldn't be bothered to request it from somewhere else. To be honest, though, I just didn't enjoy the way the book is written. Firstly, there are way too many characters and different storylines, so I often got confused and lost track of some of the more minor people. Secondly, and this was my pet peeve: it's written so pretentiously! All the characters speak in a very posh version of British English. Sure, it might be whimsical to some, but it just really annoyed me. Does everybody need to say things like, 'one must make allowances for one's shortcomings in life'? I must admit that I enjoyed it at first, but then as the book went on, the charm was lost and it became tiresome. I'm so dissapointed that I didn't like The Dog Who Came in from the Cold. 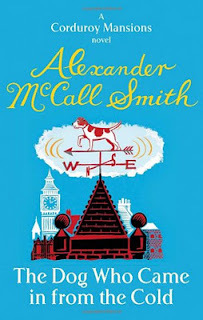 Maybe I'll go back to the library and get the first book in the series, or try something else by Alexander McCall Smith. Who knows, maybe my opinion might change.